It’s a gorgeous summer day at the Anne Arundel County Farmers’ Market. Rows of pottery are lined up on tables, basking in the sun. The mild, sweet smell of wet earth is carried on the breeze as I feel warm rays on my back. Each spectacular creation used to be a lump of clay and now stands at attention in all its glory, letting the sun take its moisture away and waiting patiently for the next phase of metamorphosis, which is even hotter still. It is apparent, viewing the clay garden planted there by Printemps Pottery, that each piece is made with love. I step into Printemps Pottery’s all-solar-powered studio and see Nevan Pearson-Cody Wise and Doug Wise at their potter’s wheels. Nevan, with laser-like focus, is forming clay into a new shape, the spinning wheel at full speed. Doug is steadily trimming what is to become a mug, making sure he gives it an accurate edge. Both glance up with beaming smiles and say “Hello!” in unison. These two are partners in work and life. 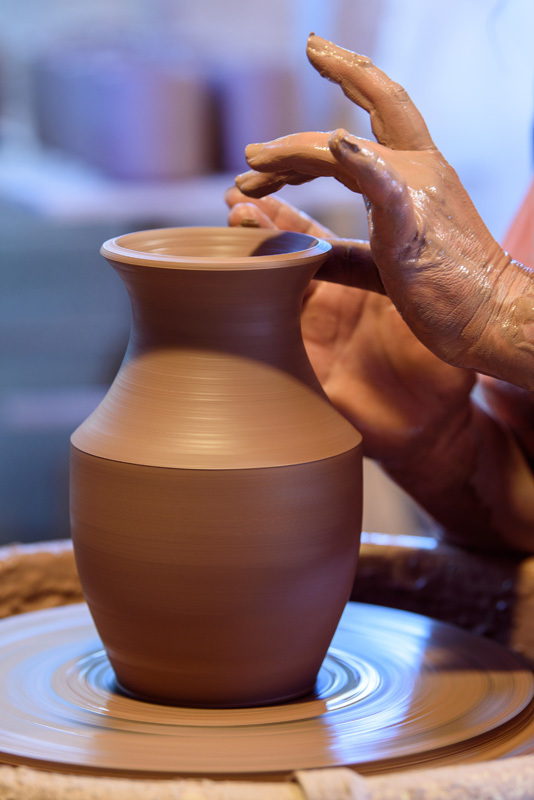 Their story is as beautiful as the pottery they create. Now married nearly eleven years, they met when they became roommates upon the suggestion of a mutual friend and inadvertent matchmaker. Doug fell in love with Nevan and she taught him how create a multitude of functional designs bursting with artistry. Nevan earned her Bachelor of Fine Arts in ceramics at Southern Illinois University. She moved to Maryland to take a job at Baltimore Clayworks, a national ceramic arts center. She was also a metal artist in Cockeysville and an art studio technician in Catonsville. She moved to Annapolis to take a job as production manager for Annapolis Pottery, choosing that job over graduate school; she considers the experience a substantial part of learning how to make a living as a potter. 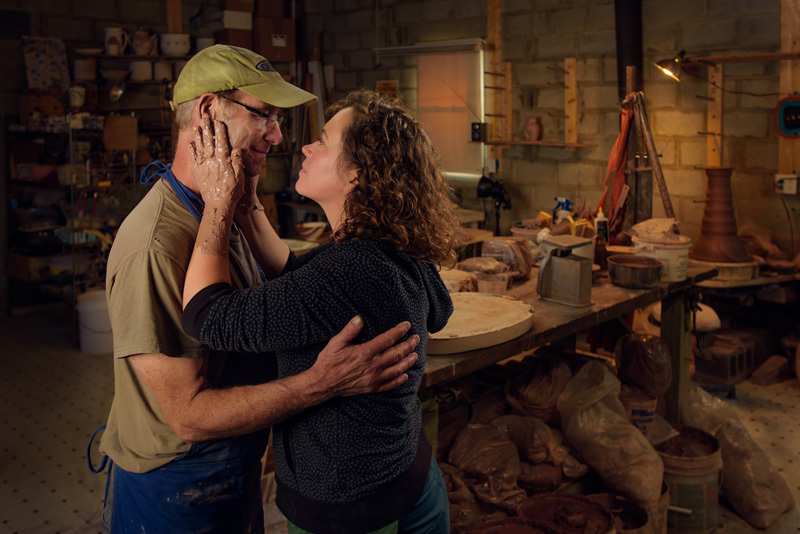 Bill and Genevieve McWilliams, then owners of Annapolis Pottery, taught Nevan a great deal, as did her mentor, Ian Stainton, also associated with Annapolis Pottery. During that time, Nevan also taught ceramics at Maryland Hall for the Creative Arts, where Doug took her class—Nevan became Doug’s roommate first, before becoming his best friend, wife, and ceramics teacher. Doug previously worked as a carpet installer for new construction and in carpet repair. Unfortunately, with the economic downturn of 2008, the volume of his contracted work diminished. He likes to stay busy and enjoys working with his hands, so instead of letting his hands be idle, he asked Nevan to teach him to work with clay. Initially, he sat at the wheel for six hours a day, throwing cylinders. His persistence paid off. Nevan created Printemps Pottery in 2008. Printemps is French for springtime, and Nevan thought it a fitting name for the business, as spring is about rebirth and creation. 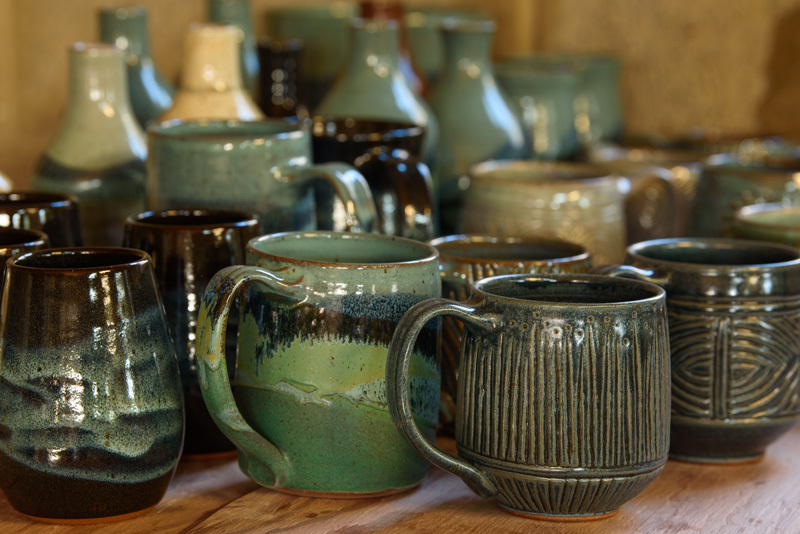 Doug and Nevan produce 50 unique pieces with seven glazes and/or specific patterns. “It took me two years to learn all of the designs,” says Doug, modestly. He initially sold his apprentice pots out of a box, graduating to the shelf later that year. When asked what his advice would be to new ceramics students, he wittily replies, “Listen to the teacher. If you experiment too much, the clay ends up on the wall!” Nevan quickly agrees. “That’s right! It’s harder than people think, to make things that are functional and beautiful,” she says, brush in hand, perfectly painting a dragonfly and bamboo motif. “Nevan has a good eye for style and design,” says Doug, beaming. He explains the process step-by-step: cut, throw, trim, sand, bisque, glaze, wipe, wax. Depending on the design, there are 8 to 10 production phases before a piece of earth can sit proudly on display in its final functional state. Error: Error validating access token: Session has expired on Saturday, 09-Mar-19 15:57:50 PST. The current time is Friday, 19-Apr-19 11:56:30 PDT.